Dr. Hawkins is a motivational speaker, consultant, certified life coach, author, workshop/seminar presenter and TV host. Her role transforming lives began as a trailblazer for a single-parent families and lecturing to leaders who are interested in leading them. She is the founder and president of Spring, Inc.- A National Single Parenting Ministry. 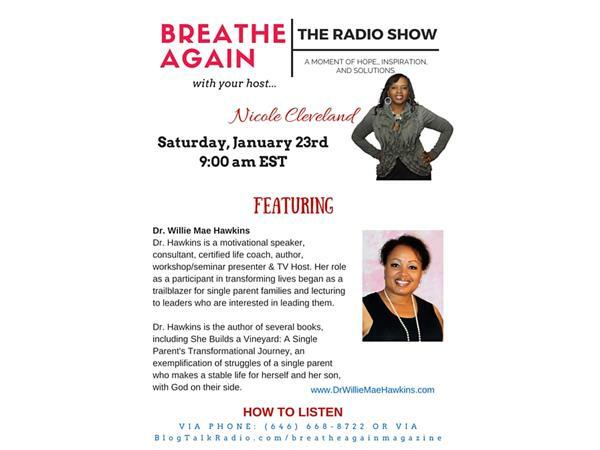 Listen as we chat about Dr. Hawkins life as a single parent and her mission to mentor single mothers and teen girls. Dr. Hawkins is the author of several books, including She Builds a Vineyard: A Single Parent's Transformational Journey, an exemplification of struggles of a single parent who makes a stable life for herself and her son, with God on their side. It is a book of hope, faith, and transformation.